The Sugar Maple Inn has been a fixture in the small town of Oldham, Connecticut for 32 years, but the era is coming to an end. After the death of their parents, the Gold children have decided to sell the inn and move on with their lives. But first, Corinna, Deborah, Maria, Maxwell and Tyler are hosting the last annual Halloween party. And as the party preparations commence, each of them faces not only their memories of the inn but also the anticipation of a future without it. 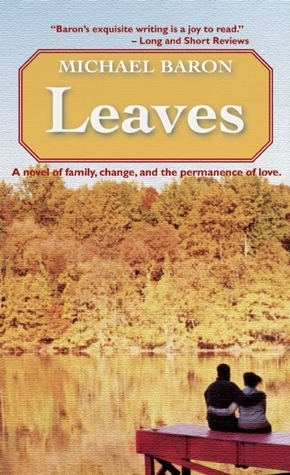 Leaves by Michael Baron is an exploration of family, their interactions and the impact of change on them. For Deborah, who has been chef at the inn for her entire career, the future is uncertain. Where will she work? What will she do with her life? Corinna is stressed about the party, while dealing with a workaholic husband and a stepson who is pushing the limits. Maria is working through the empty nest syndrome and rediscovering her love of music. Then there's Maxwell who is considering a political run, but his wife has very different ideas about their future. And finally, Tyler, a recently single artist who is trying to find his groove. But it's not just the five siblings that we get to know. We also meet their significant others and children who have their own issues going on. Each character seems very real and clearly defined, but I will say there were a few too many for me. I found myself struggling to really keep track of who was married to whom and how they related to all the others. In the end, I got it down and found that I enjoyed most of the storylines. But I do think Baron might have taken on a few too many characters in this one! Leaves is a wonderful novel to read during the Fall; I could just picture the beautiful, colors of this New England town. It is written as the beginning of a series, and these stories definitely need to continue. The ending is a bit of a cliffhanger in some respects. Now that I know all of these characters, I am anxious to read what happens next in their lives. This review was written based on an ebook copy of Leaves that I received from The Story Plant in exchange for an honest review.